Each day, Christina Arnette slides onto her finger a silver ring of the infinity symbol intertwined with a heartbeat. Stephanie Howard, R.N., a cardiac ICU nurse at UF Health, wears the same exact symbol. Both were complete strangers to one another until a life-changing event brought them together. Christina holds this infinity symbol dear as a reminder of the event that instantly shaped her life and the life of her husband, Jerry. On Feb. 23, 2016, Jerry, 43, complained of chest pains and was taken by ambulance to a hospital near the couple’s home in the Citrus County community of Homosassa. 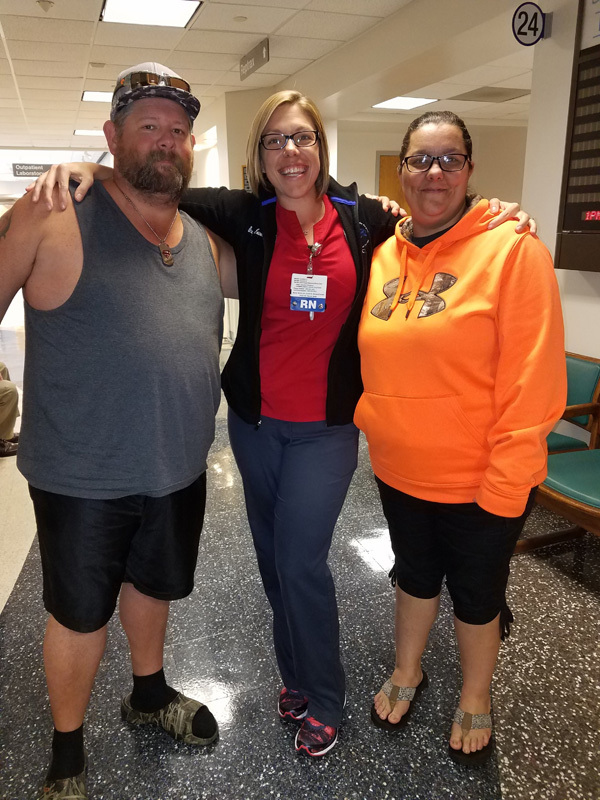 After evaluating his symptoms, physicians diagnosed Jerry with a mild heart attack, and scheduled him for a heart catheterization, a procedure performed to evaluate problems with the heart. “The night before my chest pains, I said to my kids, ‘If something happens, just remember I love you.’ It’s like I knew it was coming,” Jerry said. Two days after his chest pains, Jerry returned to the hospital for his procedure. “The last thing he remembers is joking with the staff before he went back for his catheterization,” Christina said. During the catheterization, a complication arose, which triggered a massive heart attack. The UF Health ShandsCair 2 adult flight team from Summerfield was dispatched and arrived to transport him to safety. However, despite being supported by a balloon pump, Jerry went into cardiac arrest multiple times prior to departure and remained in critical condition at the referring hospital. ShandsCair clinicians worked with the hospital’s team of physicians to stabilize him. Meanwhile, because of Jerry’s change in condition, the hospital ShandsCair was going to transport him to now declined to accept him — they were no longer a viable option. Subsequently, ShandsCair staff worked expeditiously with UF Health administrators to get him accepted to UF Health Shands Hospital to give him the best chance for survival. 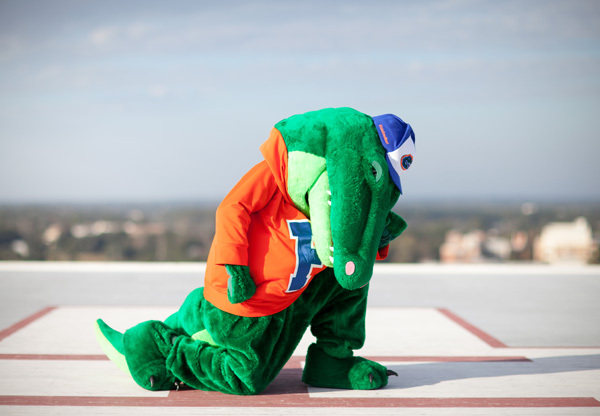 Once Jerry arrived at UF Health’s cardiac intensive care unit, his condition continued to deteriorate. At one point, nurse Howard insisted that her team continue to revive and stabilize Jerry. “You know how they say there’s a light in your soul? Stephanie said my eyes opened and she could see there was still somebody in there,” Jerry said. “She will always be a part of my life. She’s my guardian angel,” Christina said. When examining Jerry, doctors said his symptoms indicated heart failure. In addition, doctors discovered that Jerry had developed pneumonia. Since Jerry’s heart was already weakening, physicians suggested they put Jerry on ECMO, a machine that provides cardiac and respiratory support for patients in acute respiratory failure. “I said, ‘Do what you have to do to keep him alive,’” Christina said. Jerry remained on ECMO for a week and was placed in a medically induced coma for a month. Jerry was released to go home about a week after waking up from his coma. Now, he is seen every four months by Anita Szady, M.D., a cardiologist in the division of cardiovascular medicine at UF Health, to monitor his heart. In April, Jerry stopped by the ShandsCair 1 Hangar in Gainesville to visit the crew. In July, Christina and Jerry celebrated their 20th wedding anniversary. “I’m so grateful for everything that this hospital has done. It goes from the pilot of the helicopter to everyone here,” Christina said.